Cha-ching! Statistics show in 2012, the Black Friday long weekend brought in millions of shoppers and $59.1 billion in sales. On November 29, 2013, will you be fighting the crowds to scope out Black Friday’s offerings? As part of our “Holiday Survival Tips” series, here are a few secrets to capitalize on your Black Friday shopping experience! Before you leave home, have in mind what stores you want to visit and for what items. This doesn’t mean you can’t peruse other products on sale, but it’ll go far in making sure your main items are covered. 2. Is there an Online Deal? Why not skip fighting for parking spots and those long waits in lines? Before joining the crowds, check if your favorite stores have online promotions. There’s even a good chance an online sale would begin at midnight—hours before store-doors even open to the public! Leave the kids at home on Black Friday and shop with a friend who shares your shopping style. Use team-work to search out shopping list items or hold a spot in super long lines—it’ll all help expedite your day. Tip: Bringing a couple of snacks and beverages from home; it may help keep you energized while on-the-run. Advertisers stuff the Thanksgiving Day newspaper with coupons for even better sales prices. Many companies also offer online coupons. Read the small print to note any restrictions. Thirty seconds with a pair of scissors could save you more than a couple bucks—how can you complain about that? Just because it’s 70% off does NOT mean you should buy it. Stores often use Black Friday to clear out old electronic stock items (such as phones). Even with a great price, are you ready to commit to something already obsolete? Are there hidden costs—such as expensive replacement cartridges for that super-cheap printer they’re selling? Huge crowds and frenzied shoppers create the perfect setting for thieves. Keep your wallet/purse close at all times. If you have to carry a wad of cash, don’t keep it all in one location. When paying with debit or credit cards, be aware of shoulder-peepers trying to catch your PIN number. It pays to be paranoid sometimes. 7. How Much Can I Spend? Most of us don’t have an unlimited spending budget. Set a maximum dollar amount you’re willing to part with. Swiping your credit card is easy; paying for it later—not so much. Unpaid credit card bills accrue interest quickly, and your great Black Friday savings could soon be forfeited. 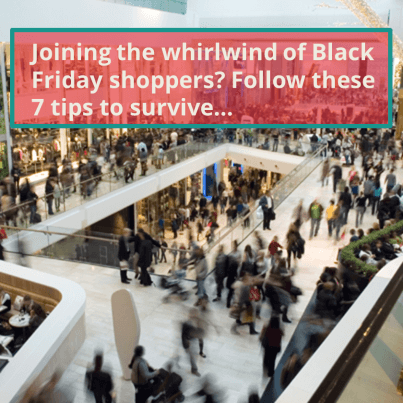 For those who simply must join the whirlwind of Black Friday shoppers, hopefully implementing the above tips will keep a little extra jingle in your pocket and a lasting smile on your face! Comment below on our dentist in Tulsa’s blog! What are you doing to prepare for Black Friday?